Please refer to the dedicated documentation to learn how to add external iOS libraries. 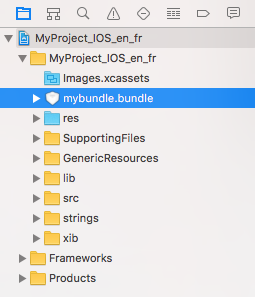 Additionaly to libraries, you may want to add resources thanks to bundles in your iOS application. To have more information about bundle, please look at the Apple documentation on the subject. Path to bundles can be relative to the project or absolute. 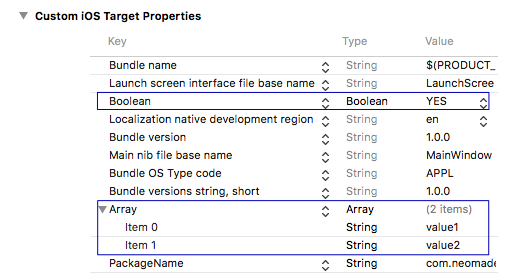 To know if the bundle was well inserted in the iOS output project, the generated Xcode project can be opened. By default, NeoMAD does not generate the bitcode for the iOS target. If you need to generate it, it can be done with the <enableBitcode> URS tag. You can check the result of the property insertion in the generated Xcode project. NeoMAD generates a default plist for the application. However, you may need to add specific information for your application in the plist. To do this, simply add the plist extra content directly in the URS in the <plist> tag. You can check that the plist properties were inserted by opening the generated Xcode project.